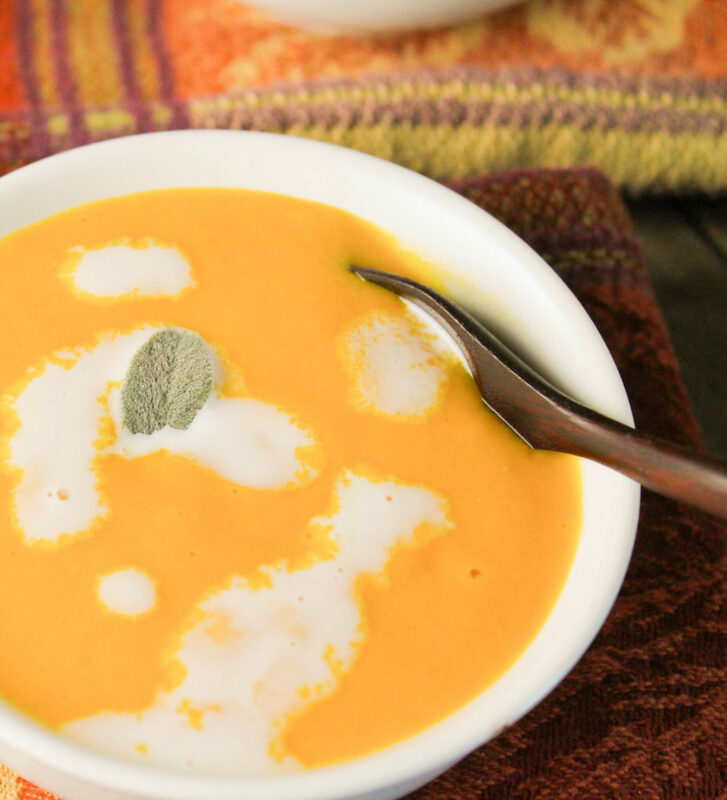 An ultra creamy and totally dairy free Paleo pumpkin soup! It’s easy to make your own bowl of comfort to warm you up….anytime of year! 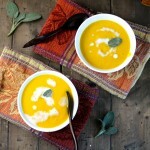 It took me awhile to find the perfect pumpkin soup, I tried loads of variations. 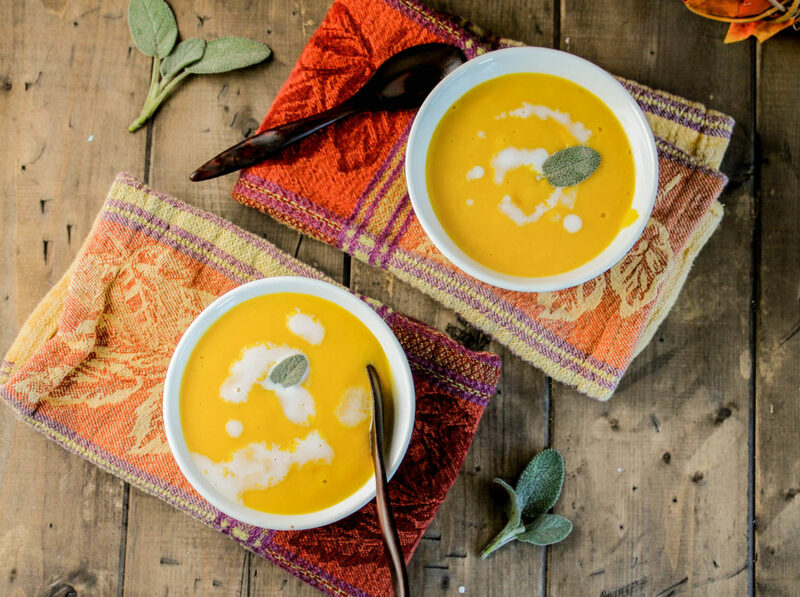 The Key to Delicious Pumpkin Soup? It is the pumpkin you are using! It is the star ingredient! Making your own puree of the right kind of squash or pumpkin in this recipe will make a world of difference. After all, you wouldn’t use mushy, flavorless apples for your apple pie….it just wouldn’t taste the same. Or put canned tomatoes on top of your salad? Nope!! Fresh squash and pumpkin puree is where it is at! I go into a tutorial and how to pick the right squashes and pumpkins for baking in this post. Have an Instant Pot? Don’t worry, I have directions for you too!! Like soup? Here are a couple of other recipes you could try!! 1 1/2 cup pumpkin or winter squash puree, see note above for fresh squash, or about 4-5 cups cubed and peeled fresh squash. 1/2 teaspoon Sea salt to taste, will depend on broth! In a large sauce pan, heat your oil/fat over medium heat. Stir in your onion, carrots, and apples. Saute for 5-10 minutes until wilted and soft. Stir in the broth, pumpkin, and sage leaves. Bring to a simmer. Puree the soup (in batches if necessary) in your blender or food processor until creamy and no chunks remain. Alternately, you could use an immersion blender right in the pot. Return to your saucepan and add the remaining ingredients. Heat gently and adjust seasonings to taste. Using saute feature, saute onions, carrots, and apple in the the fat for 5-10 minutes until soft but not brown. Stir in broth, squash, and sage leaves. Lock lid and bring to high pressure for 8 minutes, quick release. Remove sage leaves, add in remaining ingredients and puree all soup ingredients with an immersion blender or in batches in your blender. Adjust sweetener, salt, and lime juice to taste. This soup was amazing! I wanted to lick my bowl! I made it for some friends and several asked for the recipe. I only made some small changes. I did not put it through a blender because my blender stinks! I used a potato masher at the end and so it wasn’t smooth and creamy, it was more of a chunky soup which I prefer anyway. Also, I’m not a fan of coconut milk so I used cashew milk instead. I forgot to buy a lime so no lime either. I didn’t need the maple syrup. I think the apple is the secret ingredient. I will be making more of this with the rest of my leftover pumpkin. Awesome Rebecca, glad it was so loved by all!! I agree, maple syrup is not always necessary at all!! And i LOVE cashew milk, we make it all the time here at home! I added some cooked shredded chicken today! Super yum! My family love it – so happy I doubled the recipe! probably even better the next day Jen!! Thanks so much for leaving feedback! Sorry to say but this is somewhat flavorless. No garlic, no spices but sage leaves? Be yummy, some fresh ginger, or maybe some curry powder. Add to make it to your liking! This soup is a great base for infinite personalization! I made this with fresh pumpkin and it was fantastic. I shared it with my neighbor and she loved it, as well. I substituted a garnet sweet potato for the carrots because that’s what I had in the flat. I only had dried sage, so I used it, but fresh sage would be optimal. I searched and searched for a pumpkin soup recipe I liked and this one is the best! I used fresh pumpkin puree for it. Thank you, Tessa! sweet potato is a great idea, thanks for sharing your tweak Lindsay! I substituted a head of fresh broccoli for the pumpkin and omitted the lime juice and maple syrup. It was the best cream of broccoli soup I ever had! Thanks Ruth…way to adapt it!! I’ll have to try that!! This soup is amazing! But only if you leave out the maple syrup and lime juice. The first time I made it, I tasted it before adding these two ingredients and it was great, then they kind of ruined it 🙁 I’ve made it several times since without them and it is so good I can’t stop eating it! Glad you found the way you love it Anna, thanks! I’m confused as to when to put the pumpkin in…with the broth or the last ingredients? I’m confused as to when to put the pumpkin in….with the broth or the last ingredients? I am glad you caught that Vee!! With the broth, I have edited it, thanks! Since finishing our first Whole30 program last month, my boyfriend have been doing our best to keep to a paleo diet. 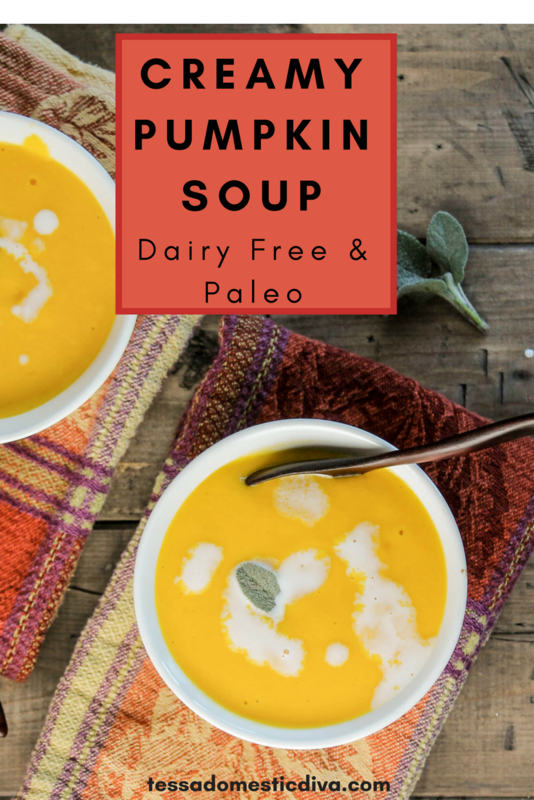 I found this recipe last week after googling “delicious paleo pumpkin soup” and was so thrilled to find a refreshing and simple recipe. I was expecting to have leftovers for lunch the next day; and the pot was bone-dry by the end of the meal. Forget a double batch, this time I’m making and freezing enough to last us through the winter! Then that is a major success Kelsey!! SO glad you all liked it so much! DId you use canned pumpkin or fresh? Which brand or type? I made this last night without any modifications. I started by baking baking and pureeing two pumpkins from the garden – this was a time consuming task but I now have 60 oz of pureed pumpkin in the freezer! The soup itself was delightfully simple to make and totally delicious. I made a double batch and am pleased I did; I have been meaning to make something special to share with coworker who is grieving. Thank you!!! I made a double batch of this last night without any modifications. Absolutely delicious; glad to have made the double batch. Yay Virginia. so glad you liked it, such a comforting, luxurious soup!! I appreciate your feedback…I really feel the fresh pumpkin puree puts this soup over the top! My girls have coconut allergy. What can we sub for coconut milk? More stock? Stock would function, but I would use a creamy homemade nut/seed milk as another great option! Do you know how to to do that? This is delicious! We used canned pumpkin because that’s what we had on hand. Will definitely make this again! Hi KIm!! I am glad to hear canned worked well…it is what most people have access too…i just usually get really pungent almost bitter tasting cans of puree that overpower things! Delicious creamy pumpkin soup. Love it thanks for sharing with Hearth and Soul blog hop. pinning. This looks amazing. I have some triamble squash – these crazy big green squash shaped like clover leaves – that would work with this, I think. Thanks for the recipe! Ooh, Elizabeth, I have never seen or heard of of the Triamble…I had to google it! And now I want one for myself! How I wish I had more space to grow all the squash I want to, so many fun heirlooms! 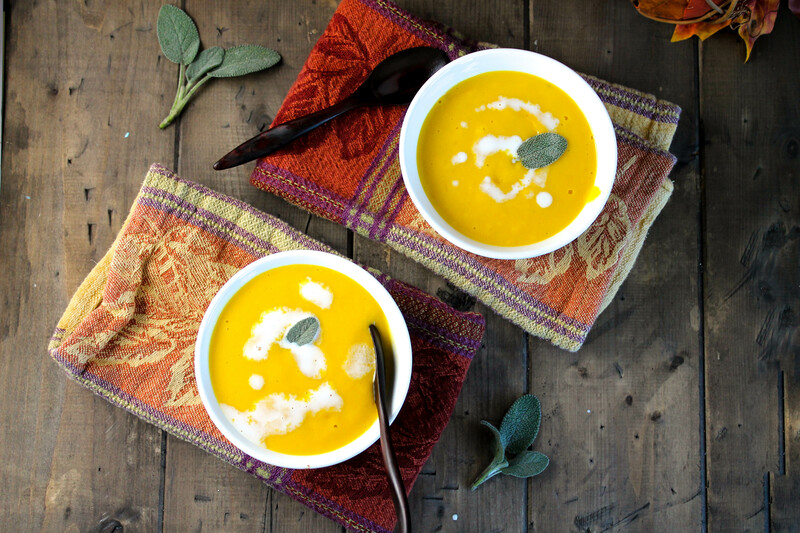 This soup will work with any good eating squash or pumpkin! This sounds excellent! What a great fall soup. I’m going to have to try it! Looks and sounds so delicious. Pinned! I love all the healthy ingredients. Sounds so tasty. Thanks for sharing on Real Food Fridays Blog hop. Pinned & twitted. I made this recipe last fall and loved it!!! Do you think it would work to make it in the crock pot? Hi Catherine! If I were to modify this for crockpot, i would probably used chunked butternut squash or sugar pie pumpkin. The flavors may not be as developed without the saute of ingredients (which sweetens and heightens flavors), but it would certainly still work! Go for it and let us know how it turns out! Thanks for taking the time to come back and let me know Jessica! This looks like a good paleo comfort meal on a cold day. I can not wait to try it. Mark recently posted…I am not going to preach the paleo lifestyle. This is the best soup I have ever had! I wish I doubled or tripled recipe! I love the look of this recipe! I’ve made paleo pumpkin soup before, and it was so yum, but I’m liking the idea of including apple! I’d imagine it adds some sweetness, awesome! I’m looking forward to Winter next year so I can get onto this soup recipe! Love more pumpkin soup recipes. This is the season for sure and I have been cooking up a pumpkin each week. This looks and sounds great! Soups are perfect this time of year and I love how healthy this one is! Tessa, this looks amazing! I have several pumpkins hanging around, I may have to try this. Thank you so much for linking up with us at Simple Meal Fridays. Katie@SimpleFoody recently posted…Simple Meals Friday!